Posted by skyvu on Thursday, August 30, 2018 in Core HR, Expense Reports, Intercompany, News, Procurement, Time and Time Off. If you are a transaction approver (such as a Financial Unit Manager or Line Manager), you can delegate your approval responsibilities for specified transaction types to another user while you are out of the office using the BPM Worklist. Note that members of an approval group need not delegate their approvals to another person, as the other members of the approval group may continue to claim and approve/reject transactions in their absence. Select the More Details drop-down list. Once on the BPM Worklist for your selected module, click your Name in the top right corner. Then select Preferences from the drop-down menu. 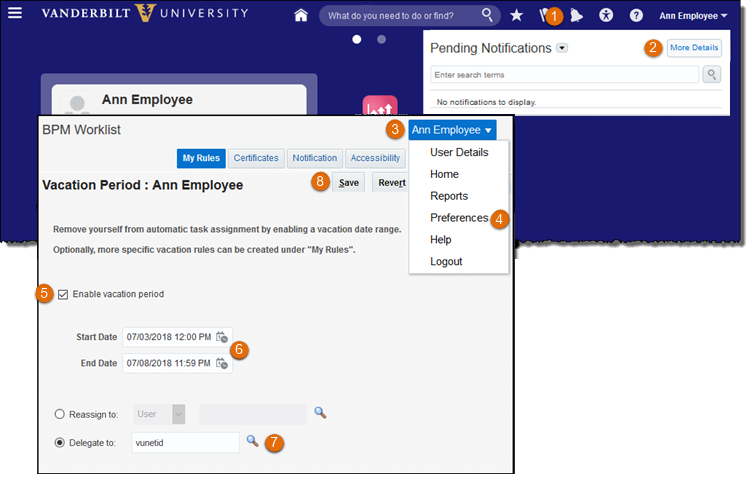 You will then view the Vacation Period screen – click the check box for Enable vacation period. Enter the Start and End Dates for your vacation period rule. Note that only new items as of the date and time you specify will be reassigned – items that are already in your Worklist prior to setting your vacation period will not be re-routed. Select the name of the User to whom your approvals should be Delegated. You should use the Delegate to option, as this will provide the delegate with the ability to complete the task on your behalf. You should not use the Reassign option under Vanderbilt’s configuration. Financial Unit Managers (FUMs) cannot delegate the approval of intercompany transactions. Intercompany transactions do not have an escalation period and will remain in the worklist until the FUM returns.